July 16, 2018 July 15, 2018 / Elizabeth T.
There’s nothing more classic than a checked print, but we can all definitely agree that the usual tartan and plaid prints of our youth are typically worn on more casual occasions. There’s a new player to the game, though, and I’m sure you all love gingham as much as me because it’s one of the funner and trendier prints for the spring and summer, right? I’ve seen gingham everywhere these past few seasons, from skirts to shorts to crop tops, and this print is definitely here to stay! If you’re not sure how to wear this cute print for a more “grown-up” look, read on to see how I style gingham as a part of my “adult” wardrobe! 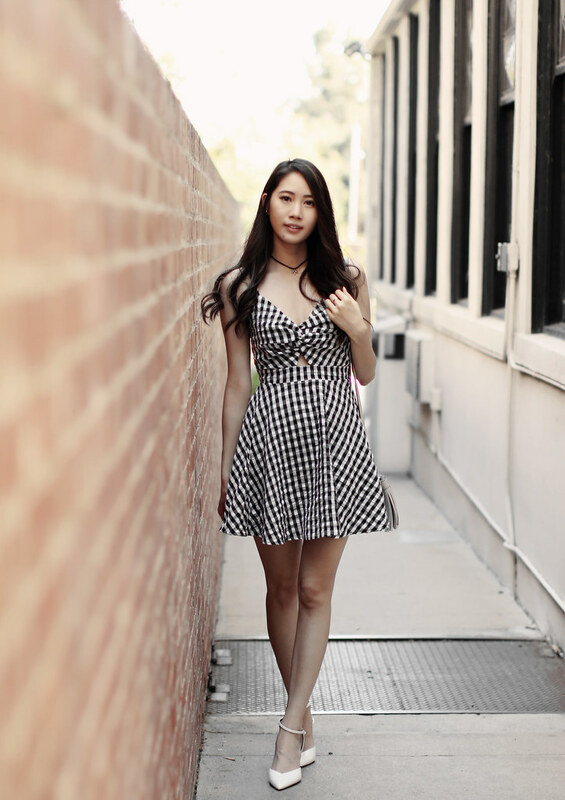 While gingham itself is a funner, younger print, it can definitely be worn in a more mature and feminine way, and this is largely determined by the silhouette of your outfit! Aside from the obvious, such as off-shoulder tops, ruffles, and skirts, a gingham dress is definitely one of the best ways to make sure your gingham ensemble screams effortlessly chic! Dresses are the literal epitome of feminine sophistication, but at the same time, the gingham print still embodies that fun, quirky nature that belongs solely to this cute print! Although I love pastels and lighter colors for the summer, there’s no doubt that a neutral and classic palette definitely elevates an ensemble for a more mature look. When in doubt, I always turn to the classic combination of black and white, and it never fails to instantly add that touch of timeless elegance to any ensemble. Let’s not forget about the details! For those of you who’ve followed me for some time now, you’ll know that I’m a firm believer of details making all the difference in any outfit, and that’s no different for this classic gingham ensemble! With a sweetheart neckline, open back, and cut-out front, the details of this dress definitely sets it apart from your usual summer sundress, since these details add a subtle touch of sensual femininity to the ensemble! Another big plus – there’s also a cute little knot-closure in the back that adds to the youthfulness of the dress as a whole! And of course, I think it’s safe to say that there’s nothing quite as “grown-up” or “adult” as heels! I remember in my teenage years, I begged my mom to let me buy my first pair of high heels for prom, and once they were in my possession, I literally felt like I’d just “officially” become a young lady hahaha! While I’m no longer that young, naive teenage girl anymore, there really is no doubt that a pair of heels really does elevate an outfit for a more refined, feminine, and mature look! Gingham is such a fun print, and it can be worn casually on many occasions, but when paired with the right accessories, it can be quite an elegant choice of fabric and print, don’t you think? What’re some of your favorite ways to wear or style gingham? Are you a fan of this print? Let me know in the comments because I always love hearing from all of you! I love gingham. My sister has a maxi skirt that I love to borrow in gingham and it looks great dressed up with heels and a simple top. Yes, it’s such a cute print, isn’t it? That gingham look is so cute! I love it. I haven’t found the right gingham style for me yet but I think it is so cute and you look great in this dress! I just love Gingham and you look beautiful in this dress! Btw I am following you on Instagram now, would love it if you could visit my Insta account & be mutuals! Thank you so much babe ❤ You're the sweetest! And yes, classic colors are always my favorite too!